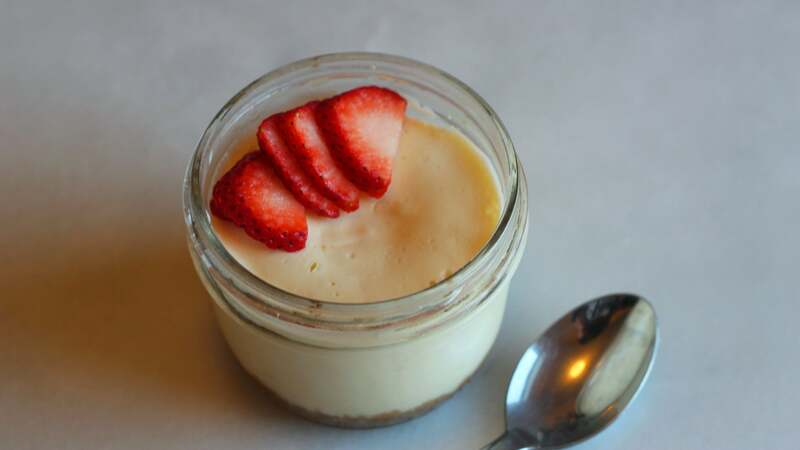 Cheesecake is one of my favourite sweet things on this earth but, as a household of one with an occasional lactose-intolerant visitor, I'm not in the habit of making whole cheesecakes for the home. There is, however, a way to make just enough cheesecake for two (or one, twice) in a Multi-Cooker, and it takes about half an hour. Baking cheesecake can be a bit of an ordeal. Between making a water bath, and wrapping the pan in foil so your cake stays dry, it's easy to get a little stressed out. But, with the Instant Pot/Multi-Cooker, the process is an easy one. There is water involved, yes, but your cake sits above it on a trivet, rather than in a bath. This means there's no reason the wrap the pan, but there's no pan anyway. 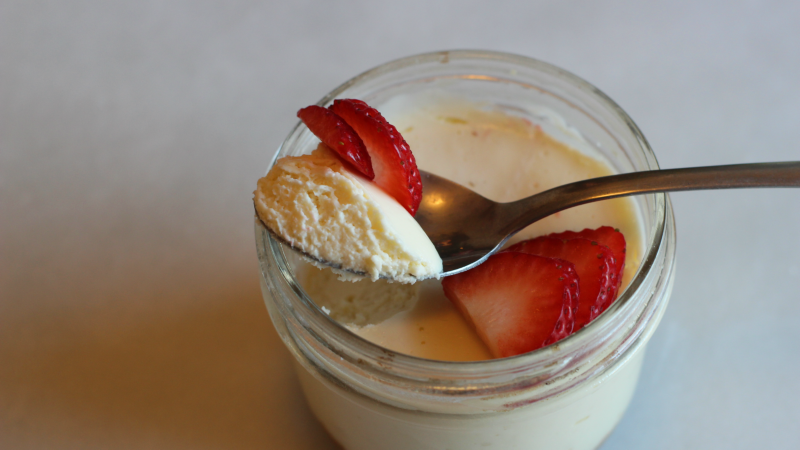 These cheesecakes can be made in individual ramekins or mason jars, and then served in whatever vessel you cooked them in. Crumble the graham crackers into fine crumbs, either in a food processor or by crushing them in a freezer bag with a rolling pin. 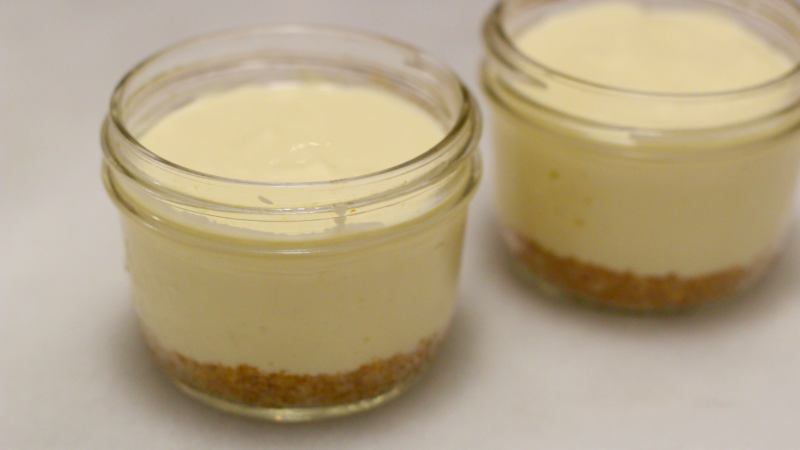 Mix the crumbs with melted butter, and press the mixture down into a ramekin or mason jar to form the crust. Mix the remaining ingredients, save for the berries, in a bowl with an immersion blender (or electric mixer) until it's as smooth as you can get it. Divide the cream cheese mixture between the two jars or ramekins, and tap them on the counter to smooth out the the tops and release any air. 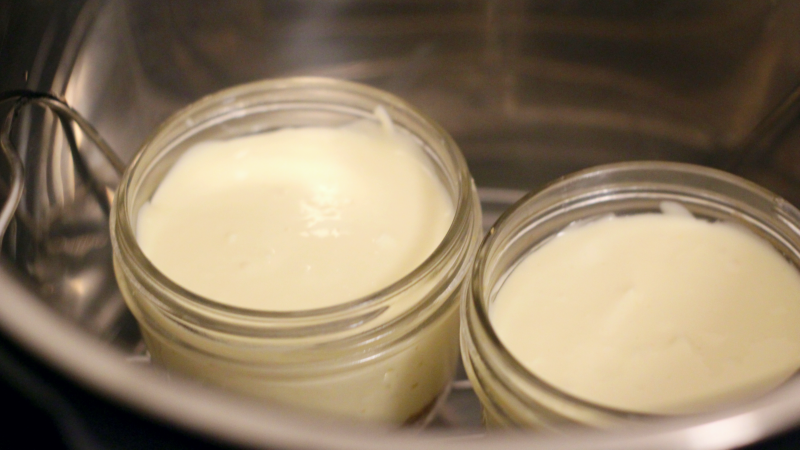 Add two cups of water to your Instant Pot/Multi-cooker, place the trivet down inside the insert, and set the cheesecakes on top of the trivet. Loosely tent the tops with foil to prevent condensation from dripping onto the cakes, and close it up. Make sure the release valve is set to "sealing," then press "manual" and adjust the cook time to four minutes using the "+" and "-" buttons. Once the cooking time has elapsed — the Instant Pot will let you know, quite loudly — allow it to naturally released for ten minutes, then release the remaining pressure by switching the release valve to "venting." Remove the cakes from the pot using an oven mitt, then let them hang out on the counter until they're cool enough to touch. Transfer them to the fridge for at least an hour to chill fully, then top with berries and serve to yourself and one other, very lucky person. Looks good, except for the, "and it takes about half an hour" when you then have to add in the extra hour for them to chill in the fridge.